There will be an After Dark discussion following the 19:45 performance on Fri, 19th May. Free to ticket holders. This production is restricted to over 14s only. Contains stroboscopic lighting effects and adult themes. A chance to see the iconic play, rarely performed in the UK, about the gay hate crime that shocked the whole world and led to the USA's 2009 Matthew Shepard Hate Crimes Prevention Act. In October 1998, 21 year-old student Matthew Shepard was kidnapped, brutally beaten and left to die tied to a fence post on the outskirts of Laramie. In the aftermath, Kaufman and fellow members of the Tectonic Theatre, spent over a year conducting interviews with people of the town. The play they devised as a result is a disturbingly frank, bewildering and at times chilling, exploration of the opinions of the people of Laramie towards homosexuality, social politics, education, class, violence, privileges and rights. 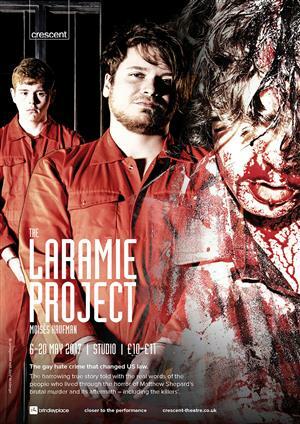 "The Laramie Project is such a wonderful piece of theatre. The @crescenttheatre production moved me to tears. See it if you can" C.B.